Currently 14.5% of Australians aged 18 – 65 are entrepreneurs. Despite this healthy number, it’s a well-known fact that not many business owners succeed. In fact, 60% of businesses don’t make it past three years. To help create more successful entrepreneurs, Dale Beaumont has gathered a superb mix of budding business owners achieving success to share their tips. This passion to inspire and educate the next generation of achievers led Dale to create the ‘Secrets Exposed’ book series. Between 2005 and 2007 16 ‘Secrets Exposed’ books were published to high acclaim and impressive sales. 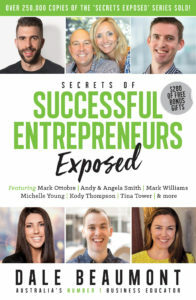 Now, ten years on, in which time Dale has developed Australia’s largest and most successful entrepreneur training program Business Blueprint and its AI version Bizversity, Dale is launching his next ‘Secrets Exposed’ series, starting with ‘Secrets of Successful Entrepreneurs Exposed’. behind their business mindset and entrepreneurial success. “Whatever you want in life, chances are someone else has already done it, so why not learn from them? Following someone’s recipe and listening to their secrets will help people make more calculated and purposeful decisions. This is my philosophy in life and it continues through this easy to read book,” says Dale. “The business environment changes so fast, the only way to keep up is to continue to learn and improve. The more you learn, the more you know. The more you know, the more you improve. The more you improve, the more you succeed.” – Skye Anderton, Ruby Olive Jewellery. “Be clear on your vision and each day do one thing that brings you closer to that.” – Mark Ottobre, Enterprise Fitness. “This has helped me remove any barriers that were in the way of my success, such as thinking small. I have learnt to believe that anything is possible when you create a clear vision of what you want your business to look like. My brain has been trained over years to always find a way, no matter what the obstacles.” – Michelle Young, POP UP Cosmetics. “Being an accountant and coming from a technical background I have always been a perfectionist, so this was a big one for me, as it required a shift in the way I perceived business processes and what I spent my time on.” – Mark Williams, Imagine Accounting. “It is important for people to see the ‘real you’ and hence know who they are dealing with without a facade. If you fail to do this, karma will come and bite you!” – Andy & Angela Smith, Dr DRiP Pty Ltd and Lifestyle Tradie Group.